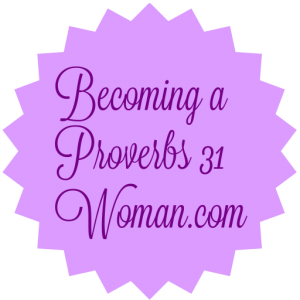 No matter how old we are or what chapter of life we are in, we all should want to become a Proverbs 31 woman. Let us take a look at what the Bible (KJV) says about her. 28 Her children arise up, and call her blessed, her husband also, and he praiseth her. When I was young and heard of the Proverbs 31 woman, I thought well I don’t have to be perfect until later in life, and I have have always been intimidated by her. I will be the first to tell you I have never been perfect and I know I never will be perfect. Becoming a Proverbs 31 Woman is not about becoming perfect or seeming perfect, it is about never giving up on our walk with Jesus, no matter what point we are in our life and our path. We should always strive to be a Woman that makes our Heavenly Father say, that’s my girl. We should strive to grow in our walk with Jesus as our Lord and Savior. Even when we fall, never give up, keep getting up and going forward with Jesus. We do not have to be perfect and we do not have to worry that we were not perfect in the past. Jesus was perfect and because of His righteousness, we are made righteous through Him, not by my or your doing. The Proverbs 31 woman is a woman that when we learn more about her, she will actually become someone that you will not be intimidated by. Please join us as we study Becoming a Proverbs 31 Woman. Please bless the person reading this, let them know their value and worth is not based on how the world sees us. Remind them and me that our value and worth comes from you, because we are all your children. Thank you for loving us unconditionally and for never leaving us nor forsaking us. I ask for your hand of protection over each person reading this and for your presence to be felt by each and every one of us and that we all learn your love is pure and unlike any other love.